Ohana Fuels helps to feed the hungry in Hawai’i County – Ohana Fuels partners with The Food Basket and donates $4,502.60. 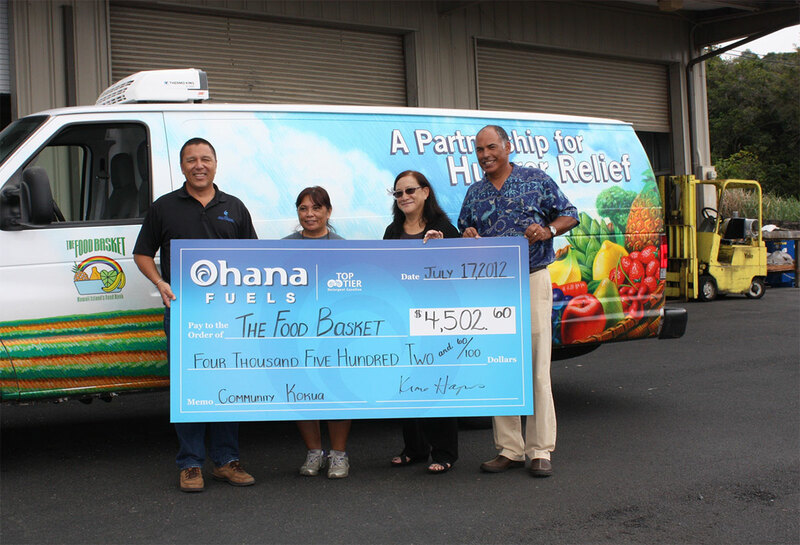 Ohana Fuels, a TOP TIER™ brand of Hawaii Petroleum Inc., recently donated $4,502.60 to the Food Basket of Hawaii. As part of an ongoing commitment, Ohana Fuels will continue to partner with non-profit organization that serve the needs of those living in our community by donating a portion of the proceeds from every gallon purchased at Ohana Fuels locations. “Ohana Fuels branded its first location in April of 2012 at Minit Stop Puainako followed by Minit Stop Leilani and Minit Stop Keaau. As we expand our branded locations we will continue to partner with non-profit organizations in a significant way”, said Mark Leong, General Manager, Hawaii Petroleum Inc. The Food Basket is an island wide, supplemental food network that collects and distributes nutritious, high quality food to low income households, the working poor, the disabled, the ill, senior citizens, children’s programs and other charitable organizations that serve this population.